AlessiLux Foreverlamp Lumiere Abatjour, Rechargable Lamp (ALFLABTJR) at Pure Design / Bedroom / Lighting ::: Furniture for the Home, Office, Home Office, and More at Pure Design Online! The Alessilux portable and rechargable Lumiere Desk Lamp is designed by Gionvanni Alessi and Gabriele Chiave. This portable and rechargeable light is the perfect companion in dark places. 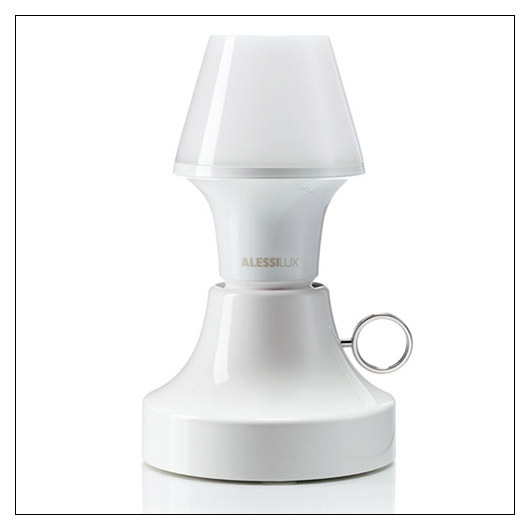 Whether used for campsites, a patio evening or to solace a frightened youngster in a dark room Alessilux Lumeires are convenient, perfect for the environmentally conscientious, and beautiful in modern design. It is light where you want it, when you want it and offers the ultimate freedom of placement. Will last up to 4 hours on a charge on full light output and up to 100 hours when dimmed. Runs on main power or battery. An energy saving "instant on" it is also perfect for mood lighting and the hospitality industry. Handle with Care. Energy saving, long lasting LED. Light output 250 lm (25W). Works best at temperatures between -20C and +45C; indoor use only. This item can only be shipped to street addresses in the contiguous 48 United States.